"Best snow conditions, casual, friendly vibe. Did I say best snow conditions? I&apos;ve skied all around the U.S. and New Zealand, worked at Snowbird for 11 years, and Grand Targhee is my favorite resort by far." "Snowbird is the ultimate mountain for skiers and riders. Its snow, and that of Alta next-door, is consistently the best in the United States." "Exceptional terrain and unmatched snow, both quantity and quality, combine for the best pure skiing experience in the U.S."
"Best quality snow from late-Dec. to late-March three years in succession. Plenty, plenty, plenty of tree skiing! The tree skiing opportunities are truly beautiful with respect to the heavy fog days. Very supportive and hospitable environment without the high cost/expense of enjoying the skiing experience!" "The only complaint I have about Jackson Hole, is that it snowed most of the time so I couldn&apos;t fully enjoy the views of the mountains. Skiing was great!" "A wonderful authentic experience. An intimate resort with an equally charming town. 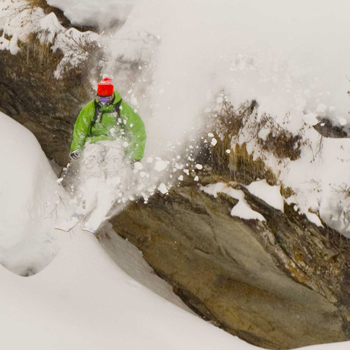 Tons of snow in January this year made the skiing epic." "We ski a different place each year. We went back to Big Sky two years in a row we liked it so much. Fantastic place, great snow, no lines good food!" "Best snow, best terrain, the lifts are worlds ahead of any other resort, you feel like you actually get value for your money here and never have a bad day. I have skied nearly every resort in Alberta and B.C. multiple times and this is the best there is. May powder days?!? Are you kidding me, everyone needs to try Sunshine Banff in their lifetime." 9. Squaw Valley Alpine Meadows, Calif.
"When it snows at Squaw, boy does it snow! A couple of last season&apos;s late storms were no joke." "Best all-around mountain in the West! From scenery to terrain, to snow coverage, to staff, to dining, Snowbasin is the best!"